As Estée Lauder famously said, "I never dreamt of success. I worked for it." As part of the POPSUGAR Insights 2016 Career Report, we surveyed over 2,000 women between the ages of 18 and 49 to ask them about their personal career aspirations, their entrepreneurial dreams, and who they look to for career advice, support, and inspirations. Overall, 58% of women between the ages of 18 and 44 have considered starting their own business. Women under the age of 30 are 5% less likely to have considered starting their own business, while women between the ages of 30 and 44 are 5% more likely to have considered becoming an entrepreneur. Interestingly, 56% of women who earn over $100,000 per year have considered starting their own business, while 59% of women who earn less than $100,000 are have considered it. Similarly, six in 10 women would rather be considered a leader than an inventor. When we look at interest in being considered a leader based on household income, it's very interesting that women who earn less than $100,000 per year are 8% more likely to want to be considered an inventor and 5% less likely to want to be considered a leader. Next, we asked women where they obtain relevant advice to help them navigate their careers. Overall, women look to their spouse or significant other (29%) to be a career resource, with women between the ages of 30 and 44 10% more likely to do so than women under the age of 30. One in five women seeks out the opinions of her parents, with women under 30 50% more likely to rely on their parents than women overall. Ten percent of women rely on their colleagues at work to provide them with career advice, and women under the age of 30 are 20% less likely to seek out a colleague. 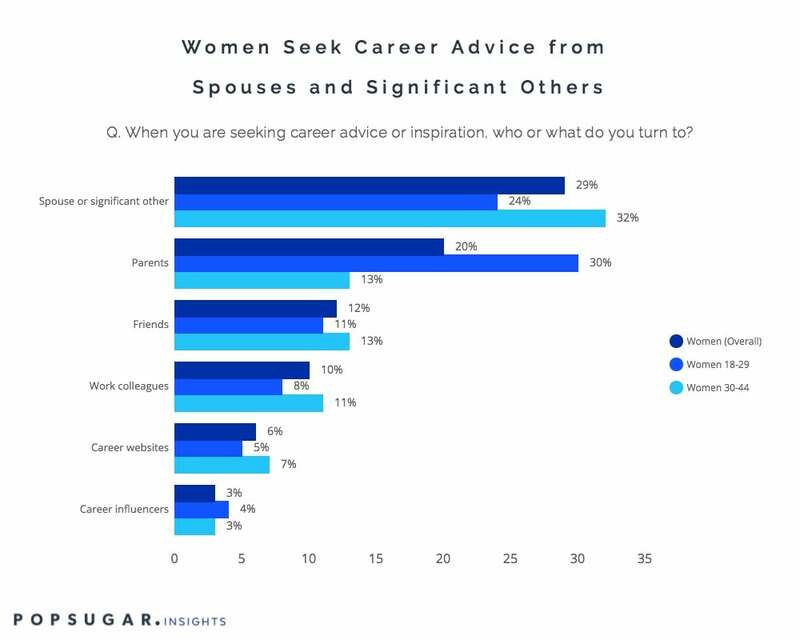 Less than 10% of women overall seek out advice from career websites or influencers, proving that this type of advice is lacking in the current offerings and that there's an opportunity for brands to fill this void and provide important career advice from successful individuals who have been there before. Finally, we asked women to share what they consider to be their dream company and the person they would most like to work for. Topping the list of dream companies by a wide margin were Disney and Google, while a relatively larger percentage of respondents indicated that they did not have a specific dream company but rather would want to work at a company where their opinions and contributions were valued. In terms of who they'd love to work with, the individuals who were most frequently mentioned included President Barack Obama, Oprah Winfrey, Bill Gates, and Richard Branson. Current presidential candidates Hillary Clinton and Donald Trump were also frequently mentioned by respondents.